KT Miniatures Journal: Look At Molly Now...With Her Two New Sisters! Look At Molly Now...With Her Two New Sisters! Do you remember this antique German "Porzellanfabrik Burggrub Doll" that was put up for sale on here in aid of the "Save The Dolls Houses Past & Present Website Fund? " Well, the other day an email with a photo dropped into my inbox from Jane Huggett of Berkshire, who purchased the old doll. 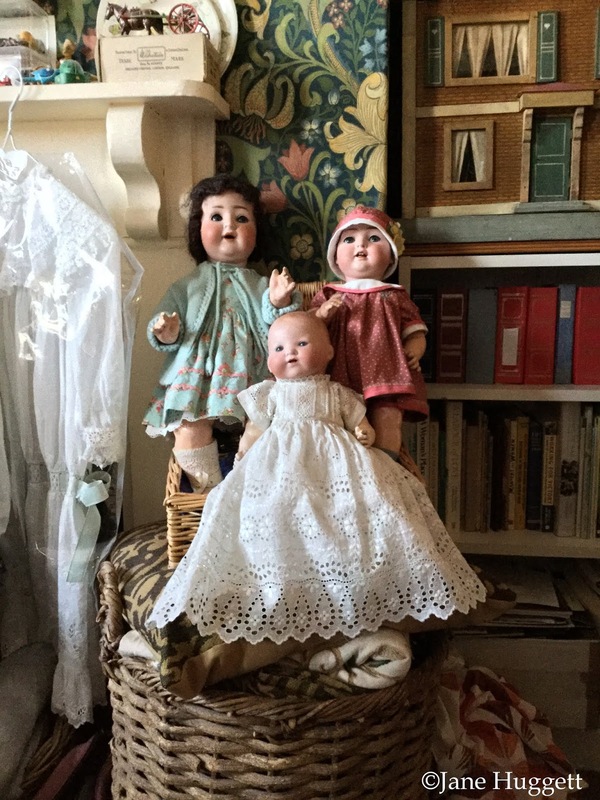 To my delight, it was a photo of this old German doll looking rather lovely in her new home, along with her two new sisters! And here she is (far left with the dark hair), and I understand she is now called Molly. 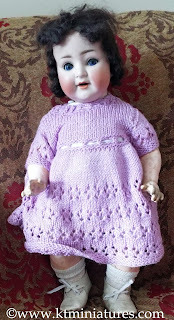 The unflattering purple knitted dress has been discarded, and Molly is now looking rather beautiful in an outfit that had originally been made by Jane's mother for another doll. Her two sisters are called Ellen and Baby, both of which had previously belonged to Jane's mother. Jane had no idea what her mother used to call the two dolls, so she decided that as her mother had been referred to as Baby by the family until she was about two years of age, she would call the smallest of the dolls "Baby". Baby is the only one with a genuine old dress and although it was not original to the doll, Jane altered it to make it fit. I think they all look rather gorgeous, don't you? Intriguingly you can just see a peek of Jane's stunning Theodore Heymann dolls house in the top right hand corner of the photo. Molly certainly looks settled in her new home, what a gorgeous photo! Thank you Jane for sharing it with us.